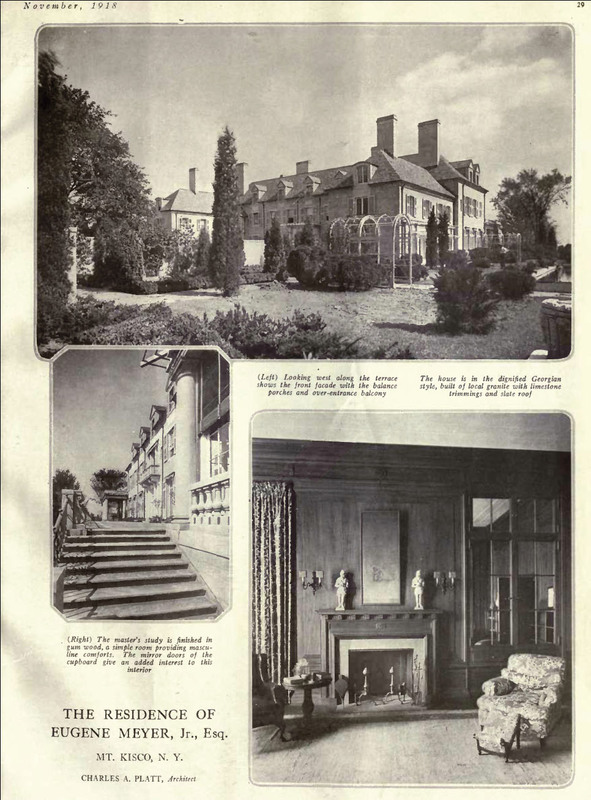 'Seven Springs', the Eugene Meyer estate designed by Charles A. Platt c. 1918 in Mt. Kisco, New York. Meyer was Chairman of the Board of the Federal Reserve from 1930-1933 and subsequently president of the World Bank Group and owner of the Washington Post. 'Seven Springs' is now owned by Donald Trump who recently received approval to develop the property, click HERE for more. Click HERE to see 'Seven Springs' on google earth and HERE on bing. 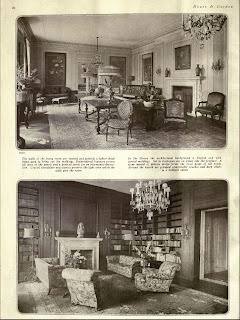 Photos from House & Garden, 1918 via DED. Well I'm positively tickled pink by this little treat! It's a shame that Trump is finally getting his way, but time marches on, I suppose. Thank you for the two posts on the Eugene Meyer properties. Mr. Meyer was a good friend of my grandfather, Davidson Sommers, and I was honered to walk his daughter, Katherine Graham, to her seat at my grandfathers funeral. This is a big treat for me. I've always loved this estate - including the much under appreciated stone Heinz mansion of "Nonsuch" on the property. When Trump sent the contents of the Meyer mansion to auction (Sotheby's) I bought the catalog. It was when bought packed with sensational furnishings and I can only imagine how barren its been the last 18-years. The bing view highlights how devoid of activity there is there. Which will change soon with swaths of trees to be removed for faux Chateaus with 7-bay car garages I'm sure. Nonsuch received some infamy back in 2009 when the now late Libyan leader Muammar Gaddafi lease the grounds and pitched his Bedouin tent just yards from the mansion. He was in the US for a UN summit. I believe the officials nixed the temp structure from being used due to a lack of permits. I was honored to be a guest at this facility in May, 1982. The Seven Springs Center was used for symposia and I was a lead speaker on A Palestinian Homeland: What should it Be? I remember the wonderful food and the friendly deer, as well as the company. I was then Chair of the Palestine-Israeli Working Group at the Department of State. Here are some of the people I discussed Palestine with. Mohammed Ahmed Addellah (Chairman, Foreign Affairs Committee, People's Assembly, Cairo), Ahmed Bahaeddin (Editor, Al Ahram, Cairo), Graeme Bannerman, (Senate Foreign Affairs Committee), L. Dean Brown, (President of the Middle East Institute), William Butler (Chairman of International Commission of Jurists), Dr. Geoffrey Kemp (National Security Council), Judith Kipper (American Enterprise Institute), Chris Kojm (Senior Editor of Foreign Policy Association), Charles Maynes (Editor, Foreign Policy), Emile Nakhleh (Professor Mount Saint Mary's College), Harold Saunders (For Assistant Secretary of State for Near Eastern Affairs), Avram Scheitzer (Ha'aretz, Tel Avis), Hisham Sharabi (Georgetown University), Howard Squadron (Chairman, Conference of Presidents of Major American Jewish Organizations), Barbara Tuchman (Historian), and many others. It was that kind of place, which could attract the best and brightest.